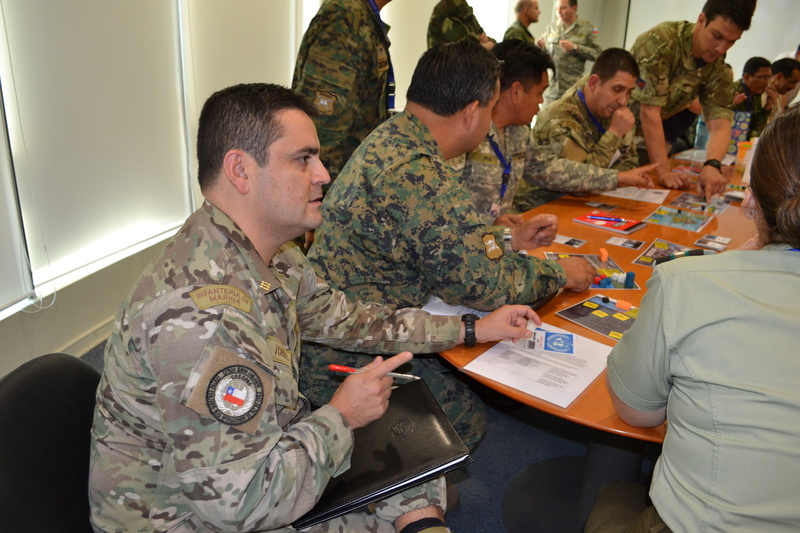 Subcomisario Fabian Mac-namara (Policia de Investigaciones de Chile) and Captain Chris Blessley (British Army) were kind enough to share this report on the recent use of AFTERSHOCK: A Humanitarian Crisis Game at the Chilean Joint Peacekeeping Operations Center (CECOPAC). 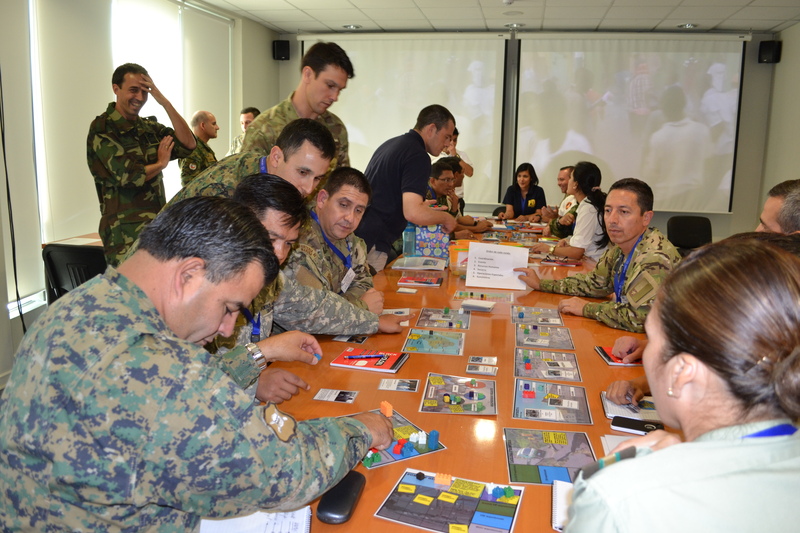 On the 9th April 2015, and for the first time in its history, the Centro Conjunto para Operaciones de Paz de Chile (CECOPAC) —the Chilean military academy specialising in United Nations peacekeeping operations and humanitarian missions—used AFTERSHOCK: A Humanitarian Crisis Game in its training programme. Two simultaneous games of AFTERSHOCK underway, as video of the 2010 Haiti earthquake plays in the background. 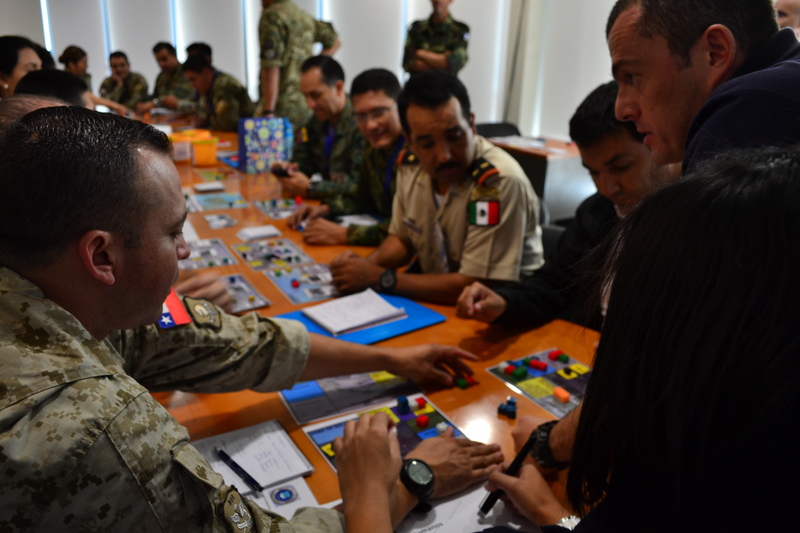 The 22 students, consisting of senior civil servants, police officers and military personnel from Chile, Ecuador, Colombia and Mexico were enrolled in CECOPAC’s two-week Protection of Civilians course – headed by Mr Jorge Canales – in which an array of humanitarian-related topics were covered. AFTERSHOCK proved a natural fit for the course and offered students a valuable opportunity to directly grapple with some of the practical and high-level issues encountered on disaster relief operations. Having been given an overview of the game’s rules and a Carana situation brief, students made their way to the ‘Operations Centre’ to begin a 2.5 hour timed version of the game. The two groups (Teams 1 and 2) were initially greeted with tense atmospherics as eerie scenes of the 2010 Haiti earthquake aftermath were broadcasted on projector screens at the back of the room. 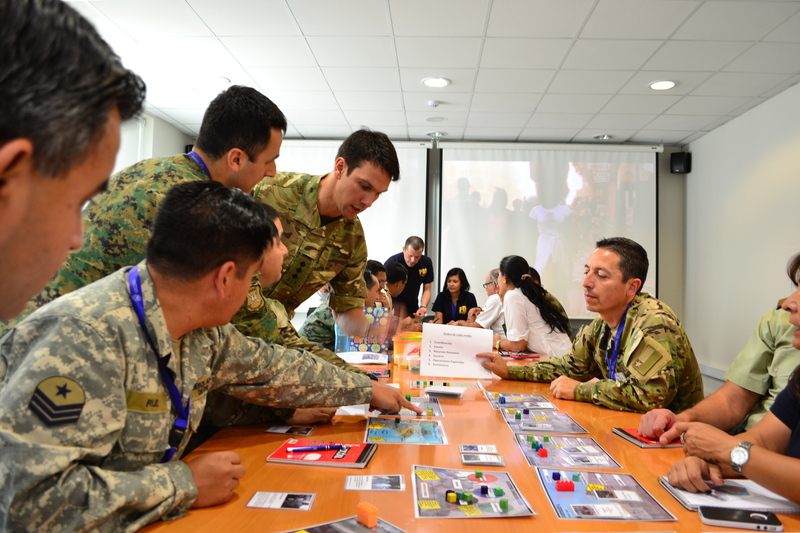 Students were guided through the first two rounds of the game by instructors Subcomisario Fabian Mac-Namara of Chile’s Police Investigations Force and Captain Chris Blessley of the British Army, but were then left to their own devices for the remainder of the exercise. The instructors helped the teams through the first two turns—after which, they were largely on their own. Confusion and disorder were rife at first as students debated strategy and how best to allocate the few resources they had. Decision-making was consequently slow, which only served to further frustrate participants as they saw precious minutes slip away from them. 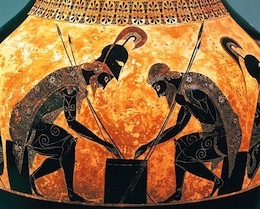 That said, once players better understood the game’s mechanics, they were increasingly able to converge on strategy and coordinate logistics which, in turn, quickly helped reverse the downward humanitarian trend. 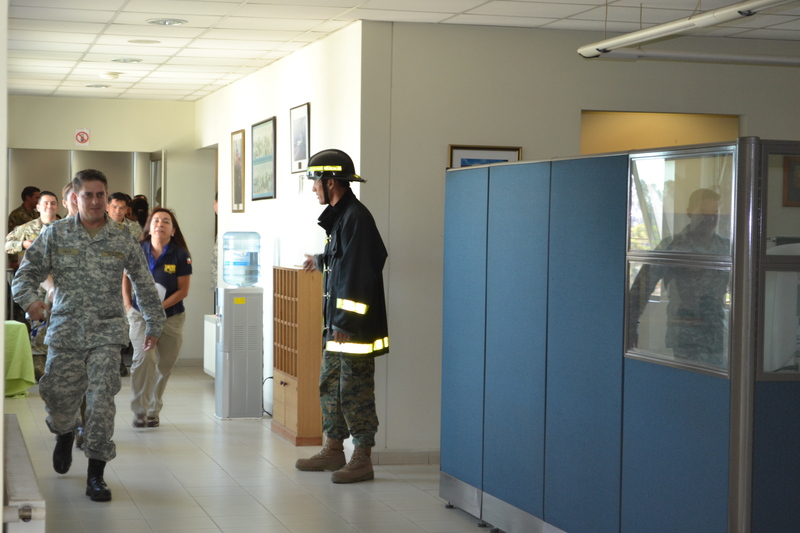 For added realism, earthquake alarm is sounded and the teams are made to temporarily evacuate the building. It was also apparent that Teams 1 and 2 differed in one fundamental professional aspect: Team 1, mainly consisting of military personnel, were far quicker when making decisions – most likely as a direct consequence of hierarchical military management structures and military commanders accustomed to making ‘command decisions’ whilst under pressure. However, their quick decision-making did not always pay off and some inane mistakes were made along the way. Team 2, on the other hand, which principally consisted of civil servants, preferred to debate strategic decisions in far greater detail and were reluctant to press forward unless some consensus had been agreed upon. Whilst their methodologies appeared more unison in nature, they finished some 25 minutes after their counterparts and very nearly failed to complete the game within the stipulated time period. In any event, the game concluded with both Teams 1 and 2 finishing with positive RP and OP points (notwithstanding that a significant number of OP points were ultimately deducted from the UN players for insufficient infrastructure and from HADR-Task Force players for failing to promptly withdraw their teams from Carana). Overall feedback from the players was immensely positive, with the vast majority of them agreeing that the game was not only enjoyable, but also provided a good introduction to some of the likely practical realities encountered on humanitarian operations. One senior Chilean army officer commented that the confusion and commotion at the beginning of the game bore a close resemblance to the discord that he experienced personally in a real earthquake relief operation in Chile. Another senior army officer claimed that, owing to the nature of his profession, he was initially very focused on his team’s individual mandate. However, as his appreciation of the game’s wider issues developed, he quickly learned the benefits of resource-sharing and working with other teams to achieve both individual and collective humanitarian mandates. Following the exercise’s success, CECOPAC will be using AFTERSHOCK as a permanent training feature on several of its humanitarian and peacekeeping courses. It’s also working with the game’s designer, Prof. Rex Brynen of McGill University, to produce a Spanish version of the game which, in turn, will hopefully disseminate its use throughout other Spanish-speaking countries.